PLEASE MESSAGE ME TO DISCUSS WHICH PIECE(S) YOU WANT BEFORE PURCHASING. I will provide further details. Thanks to the talents of designer John Clappison, Hornsea pottery remains as desirable and collectable today, as it was in the ‘70s! As shown in these photos, I have 3 items in 2 of the ranges. Just email me to say which piece(s) you’re interested in and I’ll amend this listing to sell to you. If you���re interested in several pieces I’m happy to combine postage; where appropriate/possible. SAFFRON: - Short Coffee Caddy: £5 BROWN STRIPES: - Tall Tea Caddy £5 - Tall Sugar Caddy £5 Good condition; further pics and info will be provided when you enquire about individual items. ONE DINNER PLATE. THIS ITEM IS. 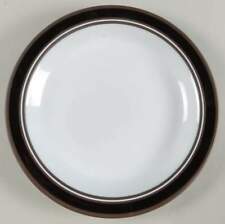 2 lovely Hornsea pottery dinner plates in good condition. Pottery Dinner Plates. With a pink, lemon and green floral design. Sorry but I cannot accept foreign cheques/checks/money orders. HORNSEA POTTERY ENGLAND SWAN LAKE DINNER PLATE 26cm diameter No chips or cracks. Lots of grey cutlery marks. See pics. Have been well used. I have lots of other items listed. I'm always happy to combine postage for multiple purchases dependant on size and weight. HORNSEA POTTERY ENGLAND SWAN LAKE DINNER PLATE 26cm diameter No chips or cracks. Lots of grey cutlery marks. See pics. Has been well used. I have lots of other items listed. I'm always happy to combine postage for multiple purchases dependant on size and weight. This is a family owned item which I believe was bought in the 1970's/80's. Hornsea Pottery traded from 1949 to 2000. It's size is 10 1/8"(25.7cm) dia. x 1"(2.5cm) deep and weighs 686g. This is a family item and I believe was bought in the 1970's/80's. Hornsea Pottery traded from 1949 to 2000. This plate is 10 1/8"(25.7cm) dia. x 1"(2.5cm)dia. and weighs 690g.